CATCHING THE BREAKS--The heroes of the Battle of Gettysburg were the ordinary soldiers that stood or advanced in the face of withering fire. There are not enough words to praise what they did. Abraham Lincoln first realized there was no way to thank all those heroes. Instead, in a masterpiece of understatement, he wrote a short epitaph for them called the Gettysburg Address. 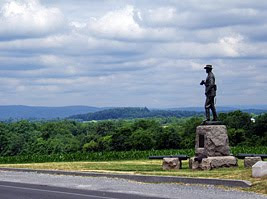 According to Battlefield Guide Gar Phillips, latter day visitors to Gettysburg often bypass the monuments pictured here. The men outlined here have been overshadowed by the passage of time, but what they accomplished 148 years ago, impacted not only the direction of three days battle, but also the outcome of the war. 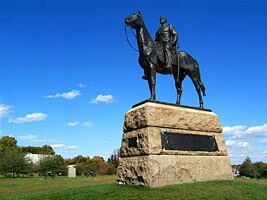 Selecting the Battlefield-- A Union cavalry unit led by General John Buford was the first to reach Gettysburg, Pennsylvania on June 30, 1863. Military strategy has long held holding the higher ground will contribute to winning most battles. It was Buford, who saw the enemy first. Buford found the high ground and relayed its location to the arriving Union Army. For the bulk of July 1, his outnumbered horse soldiers dismounted and fought off superior forces of the surprised Rebel Army. Those brave Union cavalrymen were able to prevent the Confederates from ever taking the higher ground at Gettysburg. Split Second Courage--A common ploy of Mid-18th century infantries was to attack on a diagonal (called en echelon) hoping to cause a defensive over reaction to the initial attack thus creating a gap elsewhere down the line. On the second day of battle, such a rebel attack had succeeded. In the heat of battle, federal General Winfield Scott Hancock, noticed to his dismay a gaping hole in the Union defenses. Astride his horse, he desperately looked for reinforcements. 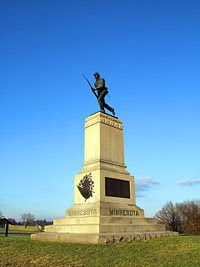 Nearby was a federal regiment (260 men) called the 1st Minnesota, who Hancock immediately ordered to “charge those lines…” The ensuing bayonet charge slashed through the Rebel first and second lines and stopped the Rebel advance for precious few minutes. That small window of time was enough for Union reinforcements to come to the aid of the Minnesotans. Had the 1st Minnesota not paid the ultimate price, the rebels would have certainly breeched the Union lines tearing federal defenses in two and most likely ended the Union effort at Gettysburg right then and there. Of the 262 Minnesotans, who made that infantry charge, Rebel bullets felled 215, leaving only 47 unharmed. By the way, you’re in charge—Three days before the largest land battle to ever be fought on American soil, President Lincoln fired his top general and replaced him with General George G. Meade. Fortunately, for Lincoln, Meade was able to find and intercept Rebel forces outside of Gettysburg. He arrived in time to take advantage of superior battle field positioning. His leadership in allowing his officers the utmost flexibility to make decisions on their own, proved to be the difference between victory and defeat. While, the rebel generals were good commanders, they faced not only a stronger enemy but had to cope with an unwieldy chain of command. Lincoln and the Yankee media chastised Meade for allowing the rebel army to escape back to the South. That wound of pride that festered until Meade died nine years later. Remember, Meade was only three days in command before the battle started. Also, it was the first major victory that the Union had won to date. And, the next day, a major rainstorm turned all roads to mud. He rested his men to fight another day. Meade deserves better from history. Images: Wikipedia. Clockwise from top: Gen. George Meade monument; 1st Minnesota and Gen John Buford. Friday: Books and Websites that inspire. Like you Tom, I love history. But your fine writing remeinds me I was bothered by this year's whole Civil War hoopla (sorry Alabama, The War Between the States). The South fired first. Robert E. Lee refused to lead the Union Army. I know President Lincoln said we need to bind the wounds with malice toward none (just before they shot him), but strip away the nostalgia and this sounds like treason to me.